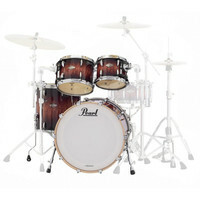 The new Pearl Masters BCX Series feature 100 percent Birch shells in 3 amazing finishes all at an affordable price! The Pearl Masters BCX feature 6-ply, 7.5mm Birch shells created using Pearl's SST Superior Shell Technology. Birch is known for its naturally EQ'd sonic characteristics with boosted lows and highs, making it a perfect fit for a naturally balanced drumset sonority. The Pearl Masters BCX feature MasterCast Hoops, the finest die cast hoops available, and the perfect blend of thickness and mass to improve the depth, clarity and focus of the drums. The OptiMount Suspension System attaches to the tom's tension rods, and provides the ultimate in stability, while at the same time allowing the drum to resonate fully without restriction.